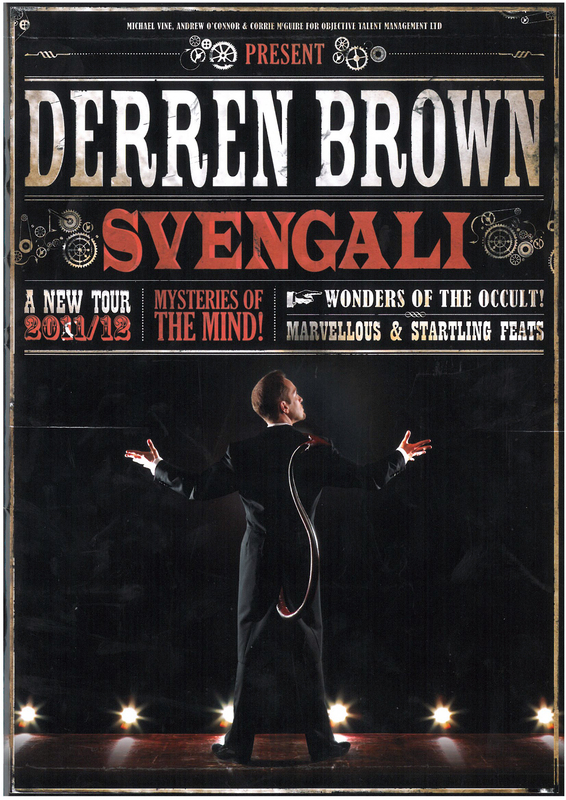 Derren Brown is at the New Theatre in Oxford this week with his new show ‘Svengali’ which I had the pleasure of attending last night. This is the second time that I have seen Derren live, having been to see his last show, Enigma, in London in 2009. He was as funny and impressive as usual in Svengali, though I remember feeling rather more amazed after seeing Enigma, but it’s possible that could simply be because Enigma was the first time I’d seen his live show. Equally it could be that his scepticism is catching, especially after watching the ‘Derren Brown Investigates’ documentary series that aired on tv in 2010 and exposed the tricks used by people who make a living from the paranormal! As Derren put it in the programme for Svengali “I am often dishonest in my techniques but I’m always honest about my dishonesty”. I can’t really tell you much about the content of the show, as that would spoil it (a request of secrecy is also made by Derren to keep the content of the show secret, as it is most enjoyable if you don’t know what’s going to happen), but I can say that it’s full of Derren’s signature abilities to read people and use the power of suggestion to achieve what seems impossible without the human tendency to turn to the supernatural for an explanation. If you’ve never been to see Derren Brown live, then I would strongly recommend it, as you will be amazed, confused and amused all in one evening. Oh, and I also highly recommend purchasing the programme, as it’s a work of comic genius and a very entertaining read.